The Omron E5CC temperature controller sets a new standard in terms of regulation performance easy set-up and outstanding visibility. With 4 outputs and many other useful features, these compact controllers, with a depth behind the panel of just 60mm, are ideal suited to many application. An optional DIN rail adaptor can be used for mounting this controller inside a panel. Other models are also available within this range. 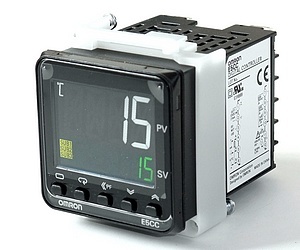 View more details of the Omron E5CC - 1/16 DIN Temperature Controllers range. Other models might not be available from stock, please contact us for price and lead time.